Tales of the Peculiar: Before Miss Peregrine gave them a home, the story of the peculiars was written in the Tales. Wealthy cannibals who dine on the discarded limbs of peculiars. A fork-tongued princess. 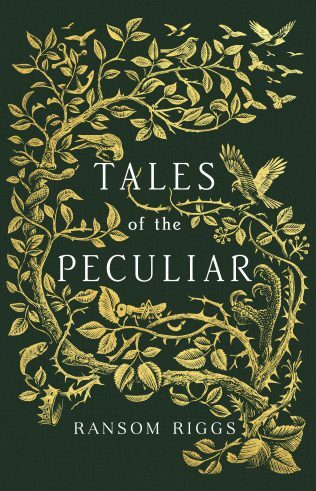 These are but a few of the stories in Tales of the Peculiar—the collection of fairy tales known to hide information about the peculiar world, including clues to the locations of time loops—first introduced in the #1 bestselling Miss Peregrine’s Peculiar Children series. You are invited to learn these secrets of peculiar history, with a collection of original stories in this deluxe volume of Tales of the Peculiar. Featuring stunning illustrations from world-renowned artist Andrew Davidson, this compelling, rich, and truly peculiar anthology is perfect for fans and those new to the series, as well. Read an excerpt and a Q&A with Ransom in USA Today.